DEARBORN COUNTY, Ohio -- Police hope the public can help them track down a "electric or bright blue" truck that might've been nearby when a former star basketball star was killed last week. Thomas Biedenharn, 73, was found dead on Memorial Day in his Hidden Valley home. 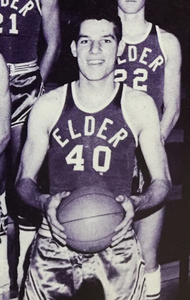 He was a 6-foot, 7-inch junior center on the 1960-61 Elder team that was ranked No. 1 in the state and went undefeated during the regular season. The team was 20-0 before losing to Withrow in the district tournament. He also played at the University of Cincinnati, and eventually moved away from the West Side and became a successful farm goods salesman. Evidence at the scene indicated Biedenharn's death was caused by foul play, and a Hamilton County coroner's autopsy Wednesday ruled it a homicide, according to Indiana State Police. ISP said a newer-model, four-door or extended cab truck might have been in the area when Biedenharn was killed. It was described as "electric or bright blue" in color. Anyone that may have seen a truck matching that description in the area over the Memorial Day weekend is urged to call the Indiana State Police, Versailles-Criminal Investigation Division at 812-689-5000. Anyone providing information about this homicide may remain anonymous.